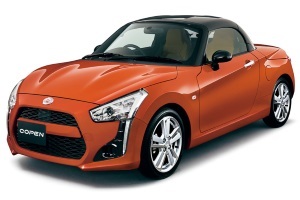 Difference between revisions of "Daihatsu Copen (LA400K)"
'''Daihatsu Copen (LA400K). 2014 to date (prod. 10,000 sold to June 2015). 2-door coupé–convertible. F/F, 658 cm³ (I3 DOHC).''' After an absence of a year and 10 months, Copen returned as an even funkier coupé–convertible. Built on what Daihatsu calls its D-frame, which is sufficiently rigid, buyers can change out the resin panels to customize their car, or to alter the look during ownership. Interior can also be customized. '''Daihatsu Copen (LA400K). 2014 to date (prod. 10,000 sold to June 2015). 2-door coupé–convertible. F/F, 658 cm³ (I3 DOHC).''' After an absence of a year and 10 months, Copen returned as an even funkier coupé–convertible. Built on what Daihatsu calls its D-frame, which is sufficiently rigid, buyers could change out the resin panels to customize their car, or to alter the look during ownership. Interior could also be customized. Daihatsu Copen (LA400K). 2014 to date (prod. 10,000 sold to June 2015). 2-door coupé–convertible. F/F, 658 cm³ (I3 DOHC). After an absence of a year and 10 months, Copen returned as an even funkier coupé–convertible. Built on what Daihatsu calls its D-frame, which is sufficiently rigid, buyers could change out the resin panels to customize their car, or to alter the look during ownership. Interior could also be customized.